New Construction ceiling soundproofing is the best way to soundproof your ceiling. Having the drywall off and joist showing allows for proper installation of the soundproof material. Soundproofing during construction is the most cost effective and most effective way to soundproof. Having a clean slate to soundproof the ceiling will get the job done right. The main goal is to stop transmission noises along with airborne noises coming from the room above, as well as the room below. Everything in the ceiling must be sealed! Everything from light fixtures to wall seams must be sealed. Proper installation leads to better results. New construction ceiling soundproofing also works in hand with floor soundproofing. To do the best ceiling soundproofing you would need our Sound Barrier, Sound Clips, Quiet Insul, MLV Tape, as well as these various other products. There are various ways to soundproof your ceiling, depending on your budget and other restrictions. To contact a consultant and find out how to create your best soundproof ceiling, please contact us at (781) 710-1261. 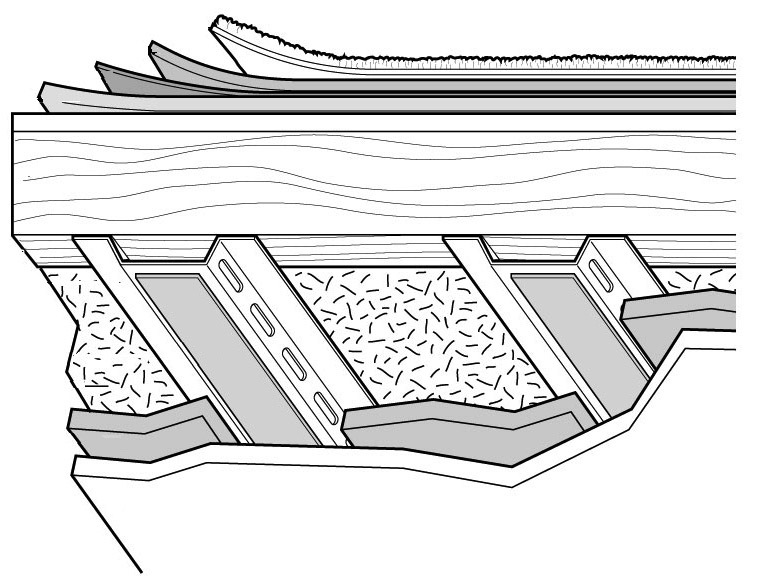 The most common ceiling soundproofing is by getting right to the joists. From there, we would put soundproofing insulation in between the joists, MLV Sound Barrier and NE Clip System on the joist. Drywall, plaster, and paint for perfection! This is the most common soundproofing structure for ceilings. These are the most common procedures for new construction ceiling soundproofing; there are other procedures available, call for more details.